The Highlanders have a very strong connection with Kahlenberg (a Mountain next to Vienna) and the Polich Church in Vienna. It is important to care about both, folk and religious traditions. Kahlenberg found its place on the guideon of the Highlanders Alliance. The Highlanders helped renovating the St. Joseph's Church on Kahlenberg. However, the whole story of the Highlanders in Vienna had a start in "Emmaus" (rooms of the Polish Church at the Rennweg Street). Rectors have been giving the opportunity to practice there. The Highlanders are the constant component during many church celebrations. Jan Pawlikowski from Małe Ciche has settled the appointment; he has been also the host. First, spoke the rector Jerzy Walkosz (of the Polish Catholic Church in Vienna). Polish Highlanders Alliance board have been settled: Tadeusz Fronek (Chairman), Stanisław Cachro (his deputy), Edward Szlaga (also his deputy). Polish Highlanders Alliance have been registered and officialy started to work. The organisation is settled. They have chosen the rest of the board: Katarzyna Marek (Secretary), Stanisław Ustupski i Paweł Krzeptowski (Treasurer), Helena Małkuch (Recorder). During the excursion to Italy, the participants took part in Holy Mess in Castell-Grandolfo (the summer residence of the Pope). Pope John Paul II has consecrated alliances Standard. A new board has been chosen: Katarzyna Marek (Chairwoman), Adam Drabik (her deputy), Stanisław Ustupski i Paweł Krzeptowski (Secretaries), Ryszard Kukuc i Bronisława Dusek (Treasurers). 2013 – Name changing of the Folk Group from "Zakopane" to "Podhalanie"
The name is changed. The Folk Group identify with the whole Podhale area. 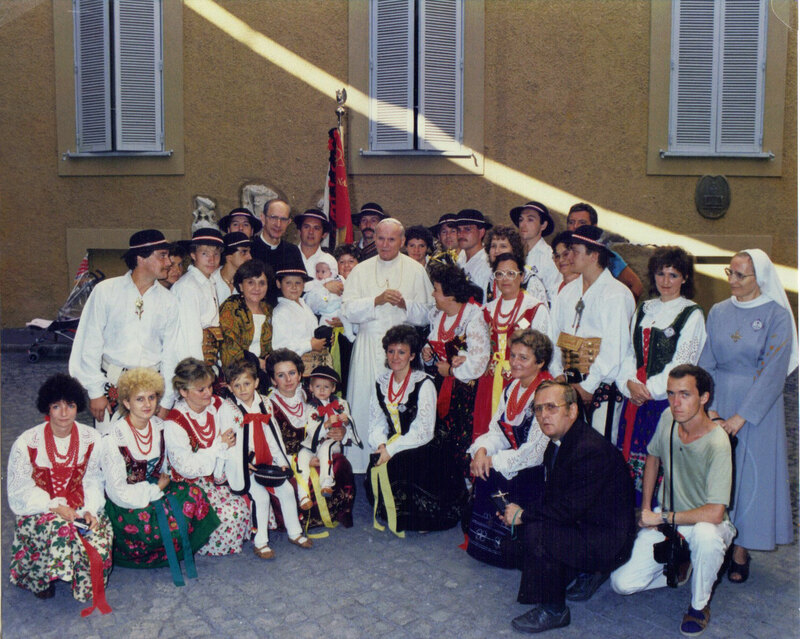 The celebrations Servis took place in Ludźmierz and have been led by Priest Kazimierz Klimczak. Guests from Vienna: rector Roman Krekora CR (Alliances chaplain) and Krzysztof Kasperek CR (Polish Church in Vienna rektor) served the Holy Mess. Many Standards joined in the Church. The celebration continued at the fire station in Szaflary (Poland). The folk dance Group gave a performance. The Alliances members received diplomas and ID's from the Chairman of the Main Highlanders Alliance Andrzej Skupień.